Your organization may be present on social media and it may have a CRM (customer/constituent relationship management) strategy, but if you don’t have a social CRM strategy that combines the strengths of those two, you’re missing a key piece of the puzzle. 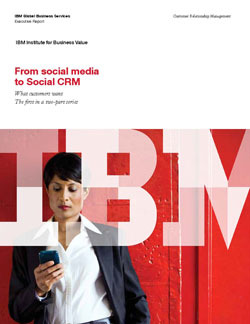 So says a new report by IBM. I can’t begin to sum up the greatness of this report, so I’m going to have to resort to a lot of block quotes. Though it’s written by and for a for-profit audience, I believe a lot of this report’s principles can be applied to the nonprofit and association crowd as well. CRM strategy, enabled by processes and technologies, is architected to manage customer relationships as a means for extracting the greatest value from customers over the lifetime of the relationship. These strategies typically concentrate on the operational responses required to manage the customer. Companies need to embrace this shift with a new strategy - Social CRM, which recognizes that instead of managing customers, the role of the business is to facilitate collaborative experiences and dialogue that customers value. Be clear on the differences between social media and other channels. Social CRM is about enabling engagement with the customer for the mutual benefit of the customer and the business. The traditional model of managing the customer relationship needs to adapt to the reality that the customer is now in control. The good news is that social media can help you gain valuable intel about a person and better inform your relationship with them, even helping you do cheaper, yet more qualitative, research about your supporter base. Make the customer experience seamless – across social media and other channels. If you know your customer in one channel, you need to know him or her in other channels as well. This means the social solution should not be devised as an isolated standalone program, but needs to be thoughtfully integrated with other customer-facing initiatives. Start thinking like a customer. Instead of asking why your company should engage in social media, ask why a customer would choose to interact with your company in a social platform. Recast social interaction strategies to focus on giving customers the value they seek and the customer intimacy will come. You can read the full report here. Post your reactions below!